The versatile MPQ1000 offers oscilloscope and DVM modes. In both modes it can monitor and record power, energy, RMS voltage and current, harmonics, inter-harmonics, harmonic direction, THD, TDD, flicker, unbalance, rapid voltage change (RVC), mains signalling and phase angle deviation as well as sags, swells and transients down to one microsecond. It also performs waveform analysis up to the 128th harmonic in real time. Data gathered during testing can be recorded by simply pushing a button. The instrument automatically detects current clamps, recognizes the range, identifies the nominal voltage and sets the triggers, after which it verifies that the unit is properly connected before allowing a test to commence. On-board data analysis is provided, and a removable SD card can be used to expand the instrument’s memory capacity easily and inexpensively. All data recorded can be viewed on the integral VGA colour display and can also be transferred to Megger’s power quality analysis software for more advanced analysis, reporting and archiving. The PC-based software supplied at no extra cost with the analyzer automatically creates custom configurations based on user requirements and facilitates tailored automatic data analysis. It also allows users to create their own analysis templates that can be loaded into the analyzer. 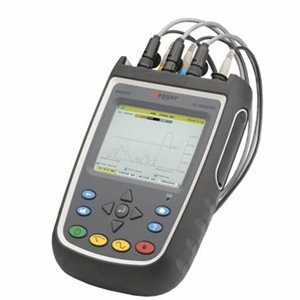 To complement its versatile handheld MPQ1000 power quality analyzer, Megger offers flexible current clamps that have four selectable ranges from 0 to 6000 A.